“Based on a true story” are five words that get tossed around a lot these days. In many cases, these so-called “true stories” take great artistic liberties. Even the most historically accurate movies don’t get every little detail right. You could argue that it’s impossible for a film to fully capture a real-life person or event. The facts aren’t always the most crucial element of storytelling, however. All that really matters is that the filmmakers encompass the spirit of the subject matter. That’s what’s going to stick with the audience after they exit the theater. Based on the novel by Lissa Evans, Their Finest centers on a group of fictional people trying to make a propaganda film regarding a very real war. Their film follows sisters Rose and Lily Starling, who took control of a boat during the Dunkirk evacuation and saved several soldiers in the process. While they believe this to be a true story at first, the filmmakers quickly find that the reports are actually full of holes. As the crew presses on, their picture slowly becomes more fiction than fact. As long as it boosts morale, though, they really don’t care how romanticized the final product turns out. Between Clash of the Titans, Prince of Persia: The Sands of Time, and Hansel and Gretel: Witch Hunters, Gemma Arterton hasn’t always ended up in the best movies. Here, however, she lights up the silver screen as Catrin Cole. Initially under the impression that she’s interviewing for a secretary position, Catrin is brought on to help write dialog for the film’s female leads. Although she’s committed to another man, Catrin finds herself falling for her co-screenwriter, Tom Buckley (Sam Claflin). All the while, they have to deal with Bill Nighy as an egotistical veteran actor, an American solider that can’t act, and all the other shenanigans that go on behind the scenes of a motion picture. Gemma Arterton hasn’t always ended up in the best movies. Here, however, she lights up the silver screen as Catrin Cole. 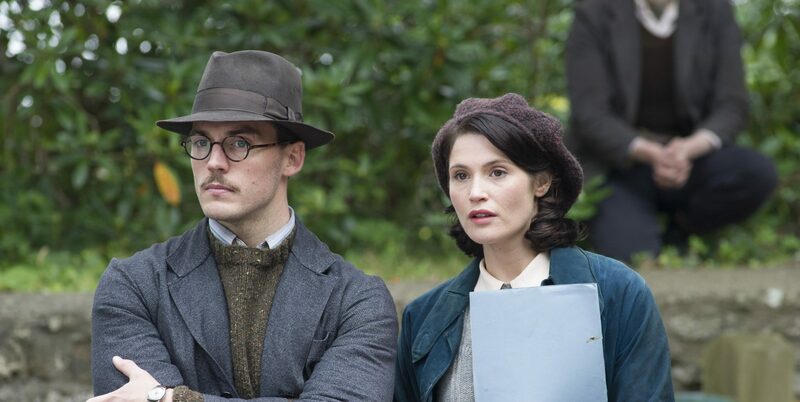 Their Finest has a fair deal in common with MASH, both the movie and the show. It doesn’t shy away from the horrors of World War II, revealing the aftermath of several bombings. It also reminds us that tragedy can strike at any time in the most unpredictable ways. Yet, the film still manages to be funny, charming, and romantic. Catrin and Tom want to produce a movie that’ll help people cope with tragedy while also allowing them to escape from the real world for a couple hours. In many respects, that’s exactly what Their Finest accomplishes. Their Finest has a fair deal in common with MASH, both the movie and the show. Lone Scherfig’s film might not be anything groundbreaking, but it is a delightful little romp with a solid balance of feel-good comedy and brutal reality. Despite being set in the 1940s, it’s themes regarding war and feminism still ring true today. Even if much of the story is fabricated, it’ll leave many audiences wanting to learn more about the Dunkirk evacuation. Speaking of which, we still have Christopher Nolan’s war epic to look forward to later this year. Until then, though, Their Finest will do just fine. This entry was posted in Reviews and tagged Comedy, Drama, Romance on April 13, 2017 by Nick Spake.